Finding out the identity of "Pachabel" on Full Tilt Poker has turned into a bit of a hobby for other pros on Full Tilt Poker. Anytime Pachabel was sitting at a table, you would have a Full Tilt Poker pro peppering him with questions, trying to determine his true identity. Pachabel all along insisted that he was Jamie Gold; however, pros such as Todd Brunson ("Jewanda" on FTP) and Ted "profbackwards" Forrest just weren't satisfied that it was in fact Jamie Gold, as Pachabel wasn't able to answer any of the questions that would prove it was in fact, Jamie Gold. 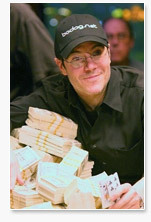 Mike "The Mouth" Matusow was so certain that Pachabel wasn't Jamie Gold that he bet Ted Forrest 10k. The identity of Pachabel has now been verified by none other than Todd Brunson, who saw Jamie Gold in person and asked him if he was in fact Pachabel. Jamie Gold said that it was indeed him, and that he sometimes lets friends play on the account, which is why he wasn't able to answer the questions that were sometimes asked of him. So Pachabel is in fact Jamie Gold, for all out there who were wondering.